Hounded by a childhood tragedy most of her adult life, Marcy Rayburn tucks tail and hides out in Bayou Country, forsaking a high-profile singing career and all chances of any meaningful relationships. No matter how long she’s been out of the limelight, the reclusive entertainer finds that she’s still fodder for the gossip news. Will the appearance of Jack, an unannounced interloper, cast her back into the spotlight and her heart into a tailspin? Unceremoniously dumped by his fiancée, Jack Connolly has spent the last few years living in an alternate reality. Going down South to repair and retrieve the company’s helicopter is a pain in his rear. That pain soon has a name, and ultimately, a grip on his walled-off heart. Is he willing to revisit his old world and sacrifice his freedom to give Marcy what she needs? Two hearts ache. But, will a soulful alliance remedy the pain or only mask the hurt? 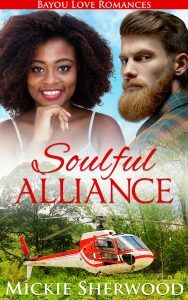 Buy Soulful Alliance on Kobo, Barnes & Noble, and Amazon!